Here are 6 travel accessories that revolutionize travel by making life easier and less stressful. These travel accessories will save you time, space, and money and can make or break your trip, especially No. 6! How many times have you found yourself with a dying or dead phone with no outlet available or no time to sit and wait for your device to charge? Having a portable charger with you at all times is a (battery) lifesaver! Whether you are traveling or not, having a portable charger is extremely useful. I use portable chargers so often, I always make sure I bring 2, sometimes 3 with me in case someone else has a dead battery emergency, or I need to charge my earphones or another device at the same time. 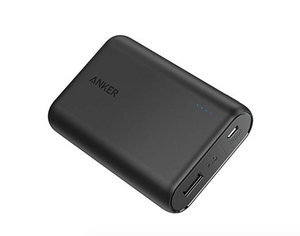 The Anker Portable Charger charges your phone 33% faster than traditional chargers and will provide you with multiple full charges. Packing can be stressful and messy. 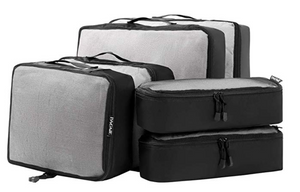 Packing cubes truly have the power to change your life! They maximize space, help you stay organized, and prevent you from over-packing. I love using the Bagail 6 piece set. It is very affordable and includes 3 different sizes that fit perfectly into carry-ons, totes, weekenders, backpacks, and duffel bags. They are durable and have mesh tops for ventilation and helping you see what’s inside. One of my biggest pet peeves while traveling is seeing dirty shoes touching clean clothes and getting marks on them? 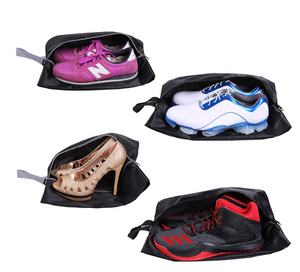 Packing cubes will save you from a mess in your suitcase and make it easier to keep shoes together. These YAMIU Travel Shoe Bags are waterproof and washable as they are made of lightweight nylon. Also, keep in mind how versatile they are as they can also be used as packing cubes. We all bring a toiletry bag with us, but bringing a hanging toiletry bag saves space and allows you to easily organize your toiletries and keeps them in one place. Rather than unpacking your toiletries and spreading them out in the bathroom, this bag makes it easy to pack up when it’s time to head back home. 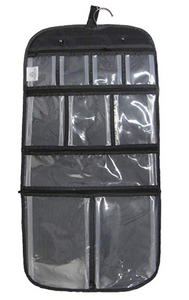 This hanging toiletry bag from Amazon is excellently designed with 10 clear zipper pockets so you can easily find what you are looking for. I used to never put locks my luggage, but it only took one frantic time where I had a luggage scare and now I won’t ever travel without locking my bags up. If your suitcase doesn’t come with built-in locks, I highly recommend getting yourself TSA Approved Locks. 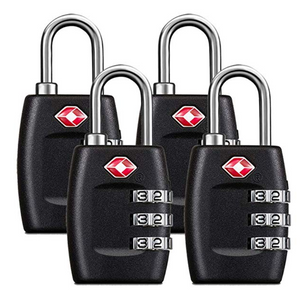 Not only can you use these locks on suitcases, but you can use them on lockers and backpacks! Making sure you have a luggage tag on your luggage isn’t usually at the top of your list for things to do while traveling but it can make or break your trip. Putting a luggage tag on every piece of luggage is an excellent way to make it easier to identify your luggage and prevent others from taking yours. When I had my luggage scare, I may not have had locks on my suitcase, but I most definitely had a luggage tag. I will never forget the time I went to Disney World, and my luggage ended up floating around Orlando International Airport. Thankfully, an my luggage had been turned in, and the airport called me to inform me they had my suitcase. If I didn’t have a luggage tag on my suitcase, I would have lost my belongings. 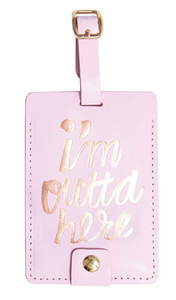 All luggage tags should include your name, cell phone number, and email address. Do NOT list your home address on your luggage tag. Having your home address publicly available on your luggage may not be the wisest idea. If this information gets into the wrong hands, you could be an easy target for robbery. My favorite luggage tag is from ban.do. They have fun travel accessories such as luggage tags, passport holders, and toiletry bags.